Good tools are a sewist’s best friend. A well-powered sewing machine, a speciality foot to help guide edgestitching or insert an invisible zipper, just the right scissors that trim seam allowances effortlessly—Norm Abrams himself would marvel at the array of tools available to make the job of sewing easier, faster, or more precise. ← Shirt-making: Yay or Nay? Thanks for confirming that this is a good tool! After a hiatus of 20 years, I recently returned to sewing and found this tool in its original wrapping while setting up my sewing area. I used it a couple of times already and found it made marking buttonholes so easy! Awesome Kay – thanks for the comment! I love finding better ways to do things, and I think this Simflex is a winner. Quick, easy, cheap, and accurate. What’s not to love? Keep sewing! this is like one of those pics, *find the mistake/error* … try as i might, i’m missing it … i also have a simflex tool, have had it for about 20 years … i’ve not *trusted* it to be accurate, so have not used it much … how different are the buttonholes/markings; i really am missing it …. Sorry my photo/explanation wasn’t more clear. 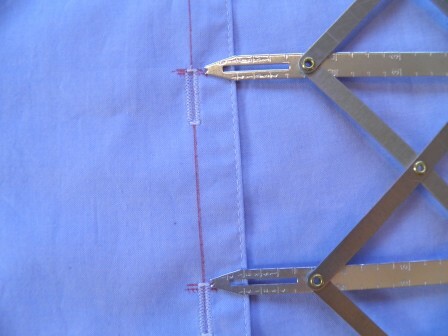 There are 2 little horizontal lines by each buttonhole – the ones I marked first by the manual method were slightly longer in the 2 buttonholes shown in the picture. I made little “crosshatch” marks on that line to show it was the wrong one. The Simflex line is above in the close-up. The thing with the Simflex is it is accurate for ALL the buttonhole markings. When I mark them manually I get some of them just the right distance apart, and some a little too far apart and some a little too close. But that is not possible with the tool because the spacing is uniform for the full length of the tool. Hope that helps, and thanks for commenting!